The largest synagogue in Europe was built in just five years in Budapest during the 19th century. The marvellous and impressive building is located at the heart of the Jewish Quarter, and it is not just one of the religious centres of the Jewish population in Hungary but is also a famous cultural and artistic centre. The Synagogue is a must-see attraction, but remember that tourists can’t visit during worship services. However, you can attend services as long as you wear appropriate clothes. The east facing building is mostly known for the wonderful patterns on its facade and its enormous rose window. In the monumental interior, captivating elements and complex themes for the Torah fascinate visitors. Several of the Károly Corner Residence apartments face the Synagogue, which is a gem of Budapest both architecturally and culturally. Many Jewish families still live in the area of the Synagogue even today. They keep cultural traditions alive and attend worship services. Wandering the nearby streets, you’ll be embraced by history as the buildings and the atmosphere in the street recall the memory of the old Jewish Quarter. In the vicinity of the building, there are many family restaurants, cafés and wine bars. There are elegant, traditional places, and more relaxed, new-wave bistros as well. In a street adjacent to Dohány utca, you can find the entertainment centre of the city which is packed with restaurants, clubs, bistros and cafés. 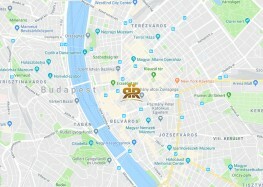 The best kosher restaurants in Budapest are within walking distance.